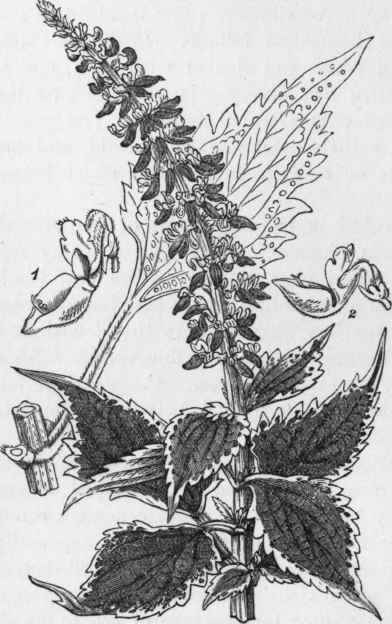 There are now innumerable garden forms of Coleus, all being derived from C. Blumei (fig. 273), a native of Java. Fancy names have been given to many of them, but as new varieties are so easily raised from seed it is practically impossible to keep pace with the variations which occur. The foliage constitutes the most ornamental feature of the plants, being so varied in colour. There are varieties having almost pure-yellow and golden leaves, others being veined with deep green, brown, crimson, etc, while many forms have shades of colour varying from pink to the deepest of reds and crimson, intermediate shades of every description being represented and more or less conspicuously veined with other distinct colours. Besides the garden forms, C. thyrsoides from Central Africa is known in private gardens. It has long spikes of deep-blue flowers. The garden varieties of Coleus are of easy propagation and culture, and, although sold cheaply, give good returns, owing to the short time they are in hand. The stock plants should be kept fairly dry during the winter, and in a temperature that falls little, if at all, below 50° F. By the end of February, with increased heat and moisture, new shoots push freely. When large enough they can be taken as cuttings and dibbled into shallow boxes of sandy soil. In a gentle heat these will soon root, when they may be potted singly. Any fairly light soil will suit. The stronger plants may be shifted into 5-in. pots (48's) to form little specimens, for which there is a demand for various decorative purposes, while the later-struck and weaker plants can be disposed of for bedding out. If there is a demand for these last, the later crop of cuttings can be put into shallow boxes, in which they may be sold without disturbance. When this is done, about two dozen should be put in each box, allowing one or two over in case of accident. The varieties for which there is most demand are those of clear decided colours and good constitution, the old Verschaffeltii being still one of the most paying kinds. [w. t]. Fig. 273. - Coleus Blumei.